Why are there so many variations on the ampersand design? Most characters have a single shape or form - for instance the letter C always looks like a C. The end caps may be different, it may have serifs, the terminals may end at a different angle, but the basic form is the same. This is true for most letters. There are however some exceptions. In the case of the ampersand, I understand that these forms all evolved from an Et ligature. Et being Roman for and. Why do some characters have these variations? Where do they come from? and why do only some retain these variant shapes and forms when most characters have a single fixed form? Modern letter forms are the product of a combination of tradition, technical considerations, readability considerations, and interactions between handwriting and printed texts as well as between several flavours of the latin alphabet (roman type, blackletter and gaelic). Therefore I doubt that anybody can make more than educated guesses as to why certain variants survived while others didn’t. After all, there isn’t any committee that decides things like that only a single form of the letter d shall be used. As a general tendency, we experienced a strong homogenisation of letter forms in the last centuries. This was probably stimulated by the industrial revolution, globalisation, an increased alphabetisation and the related advent of printed type as a product for the masses. This probably ends with the digital revolution, which made it tremendously easier to use different typefaces and letter variants – however, only time can tell whether this is actually the case. Now, why did certain variants survive? 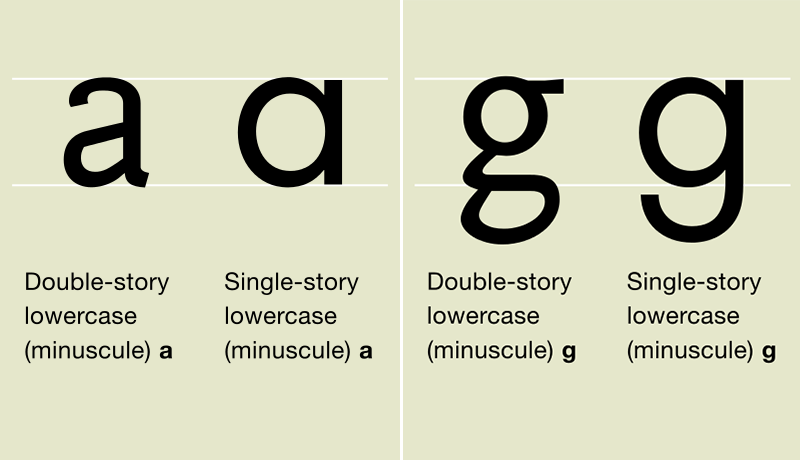 I presume that two variants of a and g mainly survived, because the two-storey variants are not feasible in handwriting, while they have advantages in print: The two-storey a is easier to distinguish from the letter o; the two-storey g is narrower and also easier to distinguish due to its unique shape. I presume that so many forms of the ampersand survived because the same processes that lead to a homogenisation of type also lead to a drastically diminished use of the ampersand: Instead of being a common shorthand for and, it was only used in titles, logos and similar and almost completely disappeared from regular text. Therefore considerations of space and readability were much less important, and æsthetics could prevail, favouring various and creative forms. Moreover, it’s in the nature of the ampersand that it is a standalone character that is not embedded in words, and thus coherence with other characters is much less of an issue. Thus the ampersand became the one character where type designers could let their creativity run wild, and it still is (with the exception of coding typefaces). The ampersand originates from the combination of the letters E and T. The latin word "et" means "and". With two letters, and the possibilities of upper and lower case, one can see there will be more permutations than with a single letter. A lot of fonts hold on to traditional versions of the symbol, while other font designers base their ampersand on the E and T of the particular font. 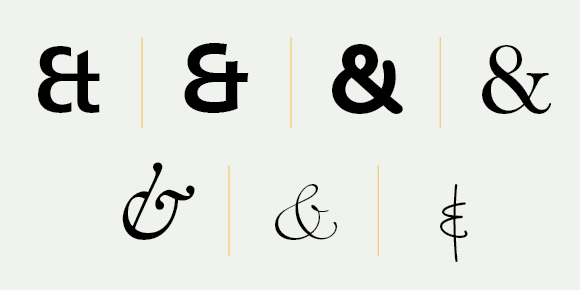 Some traditional versions of the ampersand, for example, are based on italic versions of the letters "e" and "t", even when used in conjunction with roman (non-italic) characters, making it look distinct. I am not sure that there are more variations of ampersands than any other character. There seems to be one ampersand per font set. However, they may seem more distinct for many reasons, include those above. Not the answer you're looking for? Browse other questions tagged typefaces font-design glyphs or ask your own question. “Serifs improve fast, easy readability for long text” - myth or truth? What are the historical origins of Helvetica? Are there any benefits to using kerning pairs over kerning classes? Why are there so many Unicode symbols for cats? How should I approach designing special characters I am unfamiliar with when designing a typeface? Are there fonts whose licence allows me to edit them and then resell the edited version? Is this Dutch IJ ligature suitable and readable to native speakers? Are there typefaces designed to fit inside one another?